The usage of videos for learning is well established, but the trend you should watch out for and adopt is the interactive video. In this article, I show you 5 interactive video strategies that you can use to create high-impact online training. The fact that videos continue to be a popular choice for learning is well known. Just take a look at the following stats that re-affirm why investment in video based learning makes sense. There are 22 billion daily video views: Snapchat (10 billion), Facebook (8 billion), and YouTube (4 billion). By the end of 2018, 75% of workers at large organizations will interact with various kinds of video more than three times daily (Gartner Research). 59% of senior executives agree that if both text and video are available on the same topic on the same page, they prefer to watch the video (Digital Information World). Viewers retain 95% of a message when they watch it in a video, compared to 10% when reading it in the text (WireBuzz). What Is Driving The Wider Usage Of Video Based Learning Strategies? Video based learning is seeing a wider adoption on account of the acceleration of a couple of other trends. Till a few years ago, the usage of mobile learning – providing anytime, anywhere access and, particularly, learning on the go – was deemed as a “good-to-have” component of the overall training delivery. Today, most organizations see this as a “must-have” component. The change from traditional eLearning to mobile training is also undergoing another significant change. Mobile learning solutions are now being designed to be primarily consumed on smartphones (mobile-first training solutions). As an extension, many of the formats that are commonly used on smartphones are also part of the learning strategy. Videos for learning and apps for learning are on the top of this list. 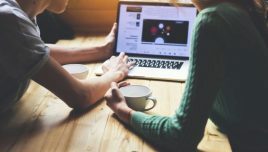 With the maturing of microlearning based techniques, they are being used to offer both formal structured training as well as informal training. They are a great fit to promote social or collaborative learning. 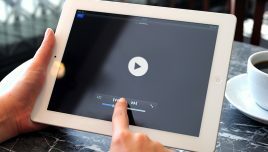 The combination of microlearning and videos leading to microlearning videos that are bite-sized had seen an increase. Learners love consuming these short videos on the go. These videos can be used to complement or supplement formal training, and with equal ease, as job aids or Performance Support Tools. What Are The Key Differences Between An Interactive Video Based Strategy Versus A Classic Video? Videos, or the classic videos, are a great option for learning, as they offer a high-impact and engaging format. However, they do not provide any control to the learner beyond the play/pause/stop. The videos are longer (running into a few minutes of run length). Organizations want to track the learner’s progress on the LMS. Organizations want to check-point (through assessments) to ensure that the learner is on track. The interactive video based strategies bring in precisely this control to provide interactivity in videos, and this is similar to the interactions available in eLearning courses. What’s more significant is that they can be tracked on the LMS. The value-adds through interactive videos are many. 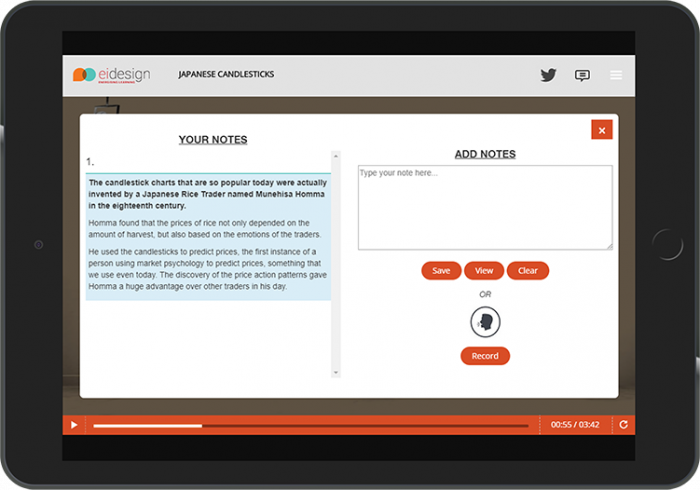 Now, you can have longer run length videos so that you are able to meet the specific learning outcome. Yet, you can continue to engage the learner through interactions. 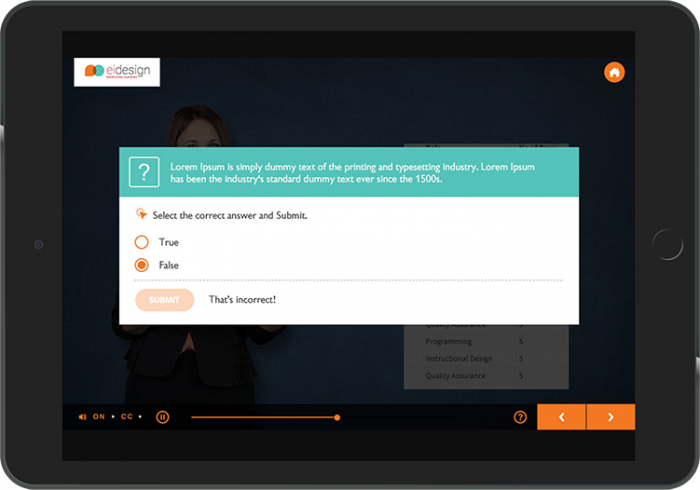 You can integrate quizzes and assessments to validate the learner’s progress. You can provide branching options. Depending on the choices that the learner makes at specified decision-making points, he or she will see a different learning path. You can track the learner progress as the output is SCORM compatible. What Are The Key Gains You Will See As You Integrate Interactive Video Strategies In Your Training Delivery? Research shows that the impact of an interactive video is 10 times that of a classic video. Furthermore, there are ways in which the adoption of interactive video based strategies will improve the learning experience and the training impact. It appeals to all learner profiles. It offers higher learner engagement quotient. It provides better recall and retention. It enables you to track the learner. It enables you to check-point and assess learning. It can be used in combination with other techniques to amplify the impact. How Can Interactive Video Based Strategies Be Used For Various Corporate Training Needs? 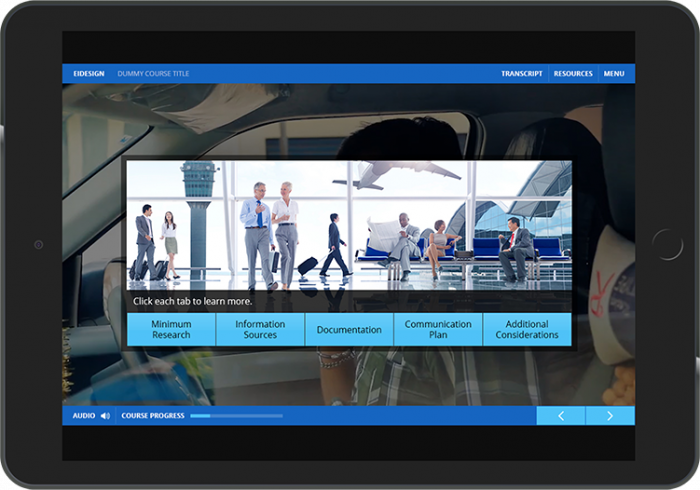 Interactive video based strategies can be easily integrated into your training delivery to offer formal, informal, and on-the-job training. They can be used to support Intructor-Led Training or, in short, ILT. Use them as microlearning nuggets and offer them as a learning path. Design them to offer formal training, as well as for Performance Support (job aids). Integrate other interesting components like gamification. Offer personalization options (from a repository of assets). Now, I pick 5 examples from our vast repository that feature varied interactive video based strategies. This approach combines interactions (corresponding to the learning interactions of the eLearning courses) to create high-impact learning experiences. 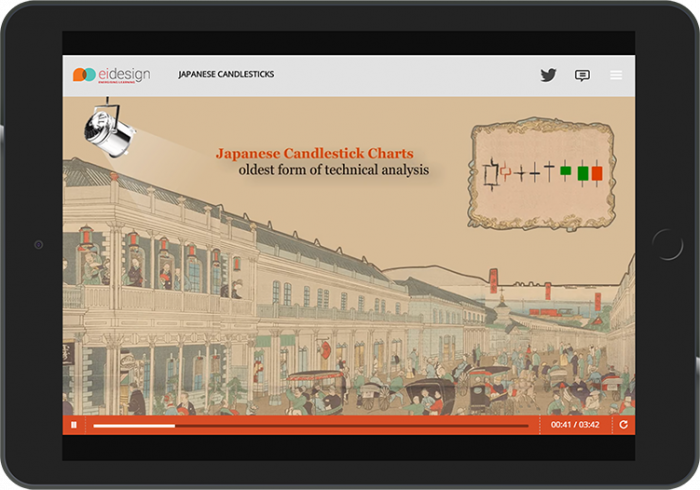 Interactive videos can be perfect for building explainer videos. Learners are enthusiastic about expert advice and guidance. By using infographics and typography based animations to support the expert’s dialogues, it creates an immersive virtual classroom experience. Additionally, interactions of various types at specific junctures make learning effective. The ease and flexibility of accessing them on the go make webcasts/podcasts ideal for Performance Support. They come with the added advantage of being brief and entertaining, much to the liking of present-day learners. While the impact of video based training is immense, they are tough to use when you have longer run-lengths. The challenge of passivity can become a showstopper. You can flip this by opting for interactive video based learning that provides a range of user interactions (including assessments and branching based on the learner’s response). It offers an interactive video framework with several features that make it an extremely useful tool for organizations to offer effective video based learning. 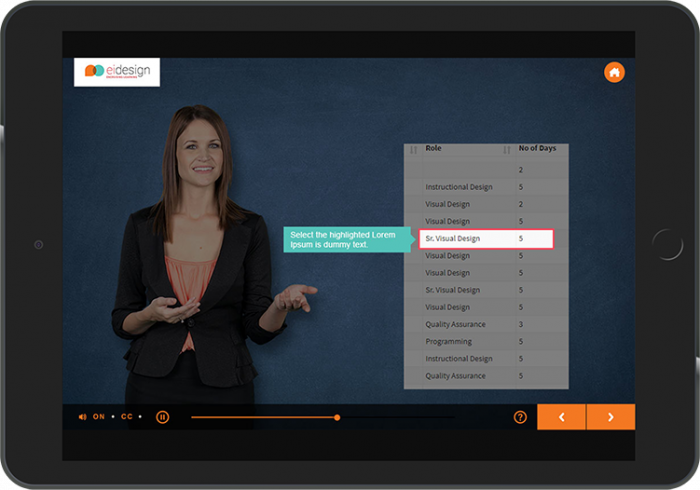 The solution is built using our interactive video framework to integrate YouTube videos into a SCORM-based eLearning framework. We can add interactivities by pausing videos at specific cue points and bring in interactions like click to reveal content, questions in various formats, hotspots etc. 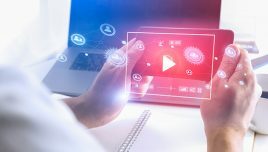 I hope this article provides compelling reasons why you should integrate interactive video based strategies into your training delivery. I am sure the featured examples give you the required insight on how you can use interactive video based strategies in your organization (for formal training, informal training, and to support Instructor-Led Training).